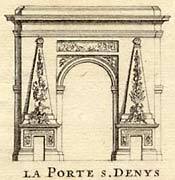 The Saint-Denis arch was erected (1671-74) by Nicolas François Blondel, and paid for by the City of Paris. Small openings were cut into the sides to facilitate circulation, contrary to the architect's wishes. A bas-relief on the southern façade represents the passage of the Rhine and the symbolic figures of the vanquished regions of the Rhine and Holland (beneath the features of a grieving woman). On the northern façade, the king is shown placing the town of Maastricht under his yoke. It was through this gate, and along the rue St-Denis, that the kings of France would return to Paris from religious services at the Basilica of Saint-Denis. 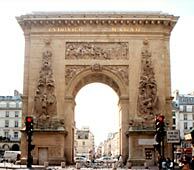 Napoleon's troops also passed through the arch, entering the city in 1816 after a victorious campaign. On the occasion of her visit to the Universal Exposition in 1855, Queen Victoria passed under the arch; she was the last sovereign to have completed this ritual dating back nearly a thousand years. On June 23, 1848, a bloody insurrection of disenchanted workers took place here, complete with the erection of barricades and capture of the national guard's post at the boulevard Bonne Nouvelle. In the ensuing firefight, over 30 insurgents were killed or wounded. The whole confligration was documented on June 25 by Fredrick Engels (the co-founder of Marxism), who subsequently published many accounts of the June Revolution in Neue Rheinische Zeitung. 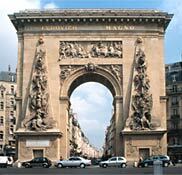 The arch of the Porte Saint-Denis served as the inspiration for the more famous Arc de Triomphe de l'Etoile (completed in 1836), as well as for the Manhatten Bridge Arch in New York (designed by Carrere and Hastings, completed in 1909). Historical factoid: Back in 1436, when Paris was still a fortified stronghold, the English  with the support of the Burgundians  had invaded and occupied an area of the city around the Porte Saint-Denis. However, their unwelcome presence was soon to be challenged: While King Charles VII was approaching Paris, its citizens began to revolt against their unwanted guests. Directed by Michel de Lailler and aided by the High Constables Richemont and Jean de Villiers d'Adam, a plan of attack was devised. Richemont, who was based in Saint Denis (outside the city limits), decided to enter Paris through the Porte Saint-Martin, while the English were expecting him at the Porte Saint-Denis. The English were soundly defeated, allowing King Charles VII to triumphantly enter the city on November 12, 1437. Location: Intersection of where rue St-Denis changes to rue du faubourg Saint Denis, and where boulevard Bonne Nouvelle changes to boulevard St-Denis, 75010 Paris. Métro: Strasbourg-Saint-Denis (lines 4, 8, 9). Buses: 20, 39. Sources: Around and About Paris - Vol. 2, by Thirza Vallois (1998, publ. Iliad Books). Voila.fr Tourisme. Marx & Engels Internet Archive. Reveland.com. Forgotten NY. Pariserve Découverte. Paris Balades. Other resources: Louis XIV of France (Wikipedia entry). Louis XIV Foreign Policy. Images: Copperplate engraving of Porte Saint-Denis, Giffart (1706), from Lombard Antiquarian Maps & Prints. Photos of Porte Saint-Denis (front & rear views), © 2003 Ian C. Mills and DiscoverFrance.net. – All Rights Reserved. Fredrick Engels chronicled the bloody uprising of workers against the government and the Assembly, a revolt which took place around the Porte St-Denis. Two days later, he added even more observations. Take a look at various views of the Porte Saint-Denis, including an antique copperplate engraving, paintings by respected artists, B&W postcards from the turn of the last century, and modern-day color photos. The second volume in a three-volume set offers fascinating historical information and suggested walking tours for the 8th through the 12th arrondissements of Paris. Highly recommended reading!